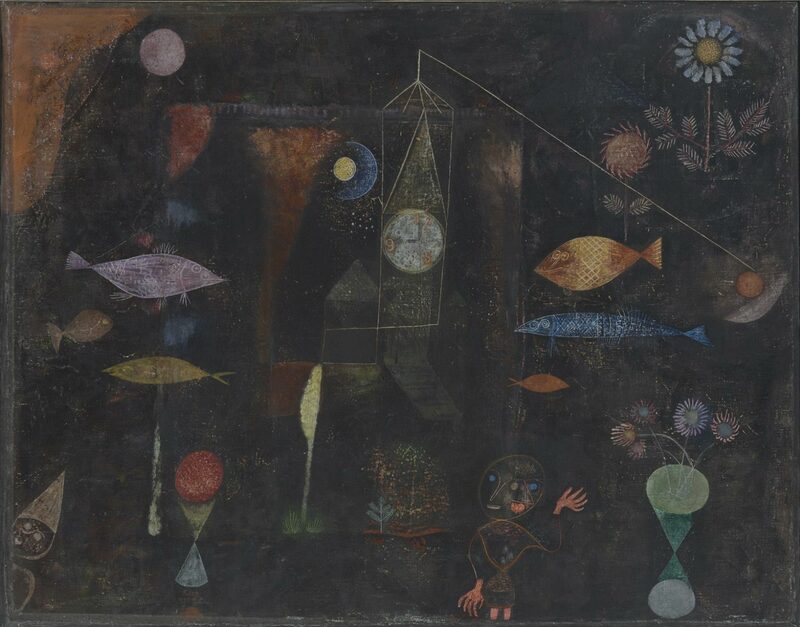 Paul Klee's Fish Magic is set squarely within the tradition of German Romanticism, with its blend of fantasy and natural empiricism, of poetry and pragmatics. In this painting, made in the middle of the artist's period at the Bauhaus, the aquatic, celestial, and earthly realms intermingle. They do so in an inky black atmosphere of indeterminate scale and scope, where fish and flora float among human beings and clock towers. The delicate black surface that washes over the entire canvas covers an underlayer dense with multicolored pigments. Klee scraped and sanded the black paint to reveal mysterious specks and passages of glowing color underneath, a sophisticated version of the games children play with wax crayons. The artist also ingeniously conceived a device to imply that there are more mysteries waiting to be unveiled: Fish Magic is actually a collage, with a central square of muslin glued on top of the surface of the larger rectangular canvas. A long diagonal line reaching to the top of the clock tower from the side seems poised to whisk off this subtle curtain. For Klee, art was always theater, and, like all his paintings, this one offers a promise of more acts to follow. Melissa Kerr, from Masterpieces from the Philadelphia Museum of Art: Impressionism and Modern Art (2007), p. 160. Paul Klee is one of the greatest philosophers and theorists of twentieth-century art, particularly in the field of color, as well as one of its greatest fantasists. In paintings such as Fish Magic these two divergent gifts are reconciled, as intellect and imagination join forces. Klee has created a space that is not heavenly, earthly, or aquatic but rather exists elsewhere, in a realm in which all forms of life intermingle. The painting is actually a collage, with a central square of muslin glued over the larger rectangular canvas surface. The sense of magic increases when one sees that a long painted line from the side seems ready to pull the square off to reveal something underneath. The dark palette and fragile muslin support give the picture a sense of silence that reinforces the mystery enveloping the inky atmosphere. Ann Temkin, from Philadelphia Museum of Art: Handbook of the Collections (1995), p. 321. Fish Magic is set squarely in the tradition of German Romanticism, with its blend of fantasy and natural empiricism, of poetry and pragmatics. That Romantic heritage led Klee to become one of modern art's greatest fantasists as well as one of its major theorists, especially in the field of color. His art is most beloved for its unending reserve of charming whimsy, inevitably bringing smiles to the least likely faces. Yet, during his decade as an instructor at the Bauhaus, the renowned German art and design school, Klee produced volumes of writings in which technical advice rises to the level of the philosophical. These two seemingly opposite poles of Klee's nature joined forces to inspire his unending experimentation with mediums and materials. Klee's technical knowledge and exactitude allowed the magician in him to conjure visions that delight and amaze. In Fish Magic, made in the middle of Klee's period at the Bauhaus, the aquatic, celestial, and earthly realms intermingle. They do so in an inky black atmosphere of indeterminate scale and scope, where fish and flora float among human beings or clock towers. The delicate black surface that washes over the entire canvas covers an underlayer dense with multicolored pigments. Klee scraped and sanded the black paint to reveal mysterious specks and passages of glowing color underneath, a sophisticated version of the games children play with wax crayons. But Klee ingeniously conceived a device to imply that more mysteries await to be unveiled. The painting is, in fact, a collage, with a central square of muslin glued on top of the larger rectangular canvas surface. A long diagonal line reaching to the top of the clock tower from the side is poised to whisk off this subtle curtain. For Klee, art was always theater and, like all his paintings, this one provides a promise of more acts to follow. Twentieth Century Painting and Sculpture in the Philadelphia Museum of Art (2000), p. 61.